Does this work in the front of our trucks? I've snapped those bolts on every XJ I've owned. I'm pretty sure those bolts are made of pudding. I bought Monroe Sensa-tracs. After all the research I did on the forums, it seemed to be the best budget shock replacement for a factory style ride. They are a good choice and likely what I'll be going with. :thumbsup: But what I meat was; what model of vehicle with give me the correct length shock for a stock height XJ with a BPE installed? 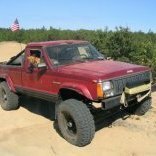 (for example, Comanche rear shocks seem to work for a 3" lift) or am I over thinking this and should just get stock ones and push out the pins. maybe that's why there aren't any examples out there in internetland. Bar pin eliminators are about 0.5" of difference. Nothing to worry about it unless rear up travel is critical. New shoes!! found a good deal on some 245/70/16 tires and wrapped them around my rubicon rims. :D though the new rubber has made it dreadfully obvious that the rear of my XJ is sagging. :( I think I'll throw on some MJ shackles for now until I put together a plan for beefier springs. nice. although if you don't already have a long enough list, that fuel filter looks nasty. It's part of the next phase. :thumbsup: also on that list are fixing the A/C, new valve cover gasket, tracbar (little loose), alternator (squeals sometimes), etc. My manches down for the moment...driving a 2nd gen dodge...I miss my jeep. Nothings near as fun as dd'ing a jeep!